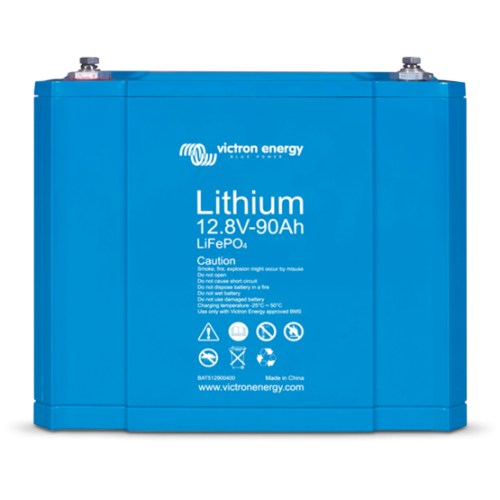 Victron range of small Lithium batteries for small off grid set-ups that want to use Lithium batteries. Ideal for light weight solutions. 70% small and 70% lighter than Lead acid batteries. For multiple batteries it is imperative that you purchase the BMS, Battery Management System, to go with these batteries. You will kill them quickly if you don’t use one. We have the BMS here. Lithium-iron-phosphate (LiFePO4 or LFP) is the safest of the mainstream li-ion battery types. The nominal voltage of a LFP cell is 3,2V (lead-acid: 2V/cell). A 12,8V LFP battery therefore consists of 4 cells connected in series; and a 25,6V battery consists of 8 cells connected in series. These batteries have integrated Cell Balancing, Temperature and Voltage control (BTV). Up to ten batteries can be paralleled and up to four batteries can be series connected (BTV’s are simply daisy-chained) so that a 48V battery bank of up to 2000Ah can be assembled. The daisy-chained BTV’s must be connected to a Victron battery management system (BMS).